When it comes to picking the perfect shoe, it has a lot to do with your outfit of choice or even your plans of the day. It also has something to do with being fashionable, if you’re big into being in style. Plus, what you wear with your shoes, from your choice in socks to your choice in nail polish, has a little something to do with looking in style. So, you’re getting read for work, a day on the beach, or a night on the town, and you need a pair of perfect shoes that will compliment your outfit and give you that professional edge or even that fun look. 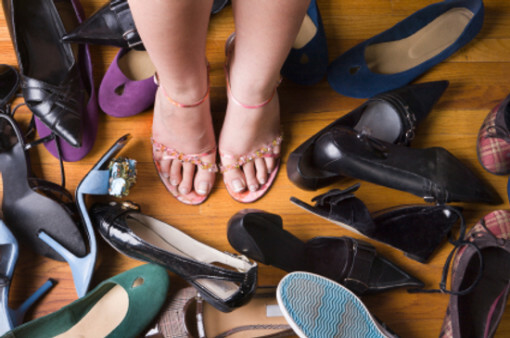 When it comes to what shoes to wear to work your first decision must revolve around your job. If you work in a factory and you have to wear steel toed shoes, then your options for being fashionable will be limited by your safety. If you stand a lot for your job you may want to opt for flats, or at least shoes with some good support in them, which can still be fashionable if you take some time looking around for them. If you spend most of your time sitting, and your job permits, some good pumps or other heeled shoes can look great with a pencil skirt or even some dress pants. Your fitness footwear needs to be less about fashion and more about comfort. Buy running shoes if you are a runner and walking shoes if you like to walk. You want to make sure that your shoes are supporting your feet, arches, ankles, and your legs, and keeping you from injuries and sprains. When you are going out for a night on the town, your shoe choice may depend on the plans. If you’re spending a night bar hopping you may want some comfortable shoes that will keep your feet moving throughout the night. If you are dancing or just going to be looking pretty, go for the heels, the higher the better! If you are heading to the beach you’re much better off wearing some sandals than some tennis shoes. You don’t want shoes full of sand, and sandals allow you to feel the warmth and comfort of the sand. Look for some of the cutest sandals of the season and you’ll surely be the talk of the beach. Don’t wear socks with your sandals, ever. It just looks bad and defeats the purpose of sandal wearing. Plus, while those rubber shoes with holes in them may be comfortable, they do not look fashionable, in the least. Pass on them for something more stylish.